Sharing together a “movable feast,” the members of Alliance Française de DuPage represent the amazing nature of America’s melting pot. Whether European ex-pats or admirers of all things French, they’ve discovered a unique bond in their cultural connections. (Left to Right) Brooke Leaton, Korin Heinz, Diane Hoffmeyer, Charles Coulon, Judy Fields, Cynthia McLaughlin and Barbara Young standing behind the Alliance Francaise de DuPage booth at French Connection Day. For all the talk in the news lately about the comings and goings of immigrants, little is reported about those who’ve shaped our past, and few immigrant groups have shaped it like the French. In the northwest suburbs, you’ll find French immigrants joining with American-born lovers of all things French, as they together celebrate French culture, food and films. Nearly 130 such friends gather together as members of Alliance Française de DuPage. Members meet about twice a month at various restaurants, libraries, parks, or homes as they enjoy the traditions of this European nation, discuss their latest trips to French-speaking countries and converse in the French language. On some occasions, members can be found at restaurants in communities such as Geneva, Aurora and Naperville huddled over a laptop keeping tabs on international soccer games or French elections. As AF de DuPage’s tagline suggests, it really is a “Moveable French Feast in Chicago’s Western Suburbs.” But, of course, that’s also a nod to the former Chicagoan and one-time Parisian Ernest Hemingway. For a truly French experience, there will be wine – when appropriate. In April, about 80 members headed north to Wollersheim Winery and Distillery, in Prairie du Sac, Wis. They learned about winemaking and distilling at the winery owned and operated by Philippe Coquard, a transplant to America. This 13th-generation winemaker hails from the Beaujolais region of France. AF de DuPage’s members are joined with a worldwide network of people who admire French culture. There are about 22 Alliance Française chapters in the U.S. and more than 1,000 such groups worldwide. The local group has been in operation since 1976, when a handful of people first met in the basement of a Realtor’s office in Naperville. The group’s beginnings were supported by French professors at North Central College, says Jeannine Cowart, of Naperville, a longtime member and former president. Cowart grew up in the French-speaking part of Switzerland, so AF de DuPage is both a means of nostalgia and a place to speak her native tongue. “It’s the language that I love,” she says. Naperville resident Cynthia McLaughlin, who currently serves as the group’s co-vice president, fell in love with French culture, the countryside and the people when she took a trip to France in 2000. “The trip changed my life,” she says, adding that it provided new insights into how other people live. After returning to the United States, McLaughlin did a search online for French cultural activities in Illinois and found AF de DuPage. The presence of the French in America dates back long before France’s assistance in the American Revolution, to a time when French explorers, Voyageurs and Roman Catholic priests ventured into the wilderness west of the Appalachians. Many traversed the rivers and lands of Illinois (a word with French roots). It’s also no surprise that Bastille Day, the French equivalent of America’s Independence Day, is a special occasion for members of AF de DuPage. French activities like Petanque and crepe-making work themselves into many gatherings of AF de DuPage. Here, the crew from Lil’ MAD Cafe Gourmet Shop, in Westmont, makes crepes at French Connection Day. On July 8, the quiet atmosphere of Herrick Lake Forest Preserve, in Wheaton, is broken by the sound of the Marseillaise (the French national anthem) sung with gusto, following the group’s annual Bastille Day Pique-Nique. Then the dancing begins, with folk dances original to the Brittany region of France. Ashley Fain of DeKalb, an avid international folk dancer, leads the way. About 30 percent of the group’s members are naturalized Americans, and no matter their origin, they’re invited for free French pastry-making classes, at College of DuPage, designed exclusively for the group by Chris Thielman, Professor of Culinary Pastry Arts. He is a longtime member of the group with his wife, Karen, the newly elected president of AF de DuPage. The Thielmans, both American born, have been members for 18 years. They enjoy visiting France, but at first their French was found wanting. “We decided we should learn the language,” Chris says. They joined AF de DuPage to not only improve their French, but also to share his knowledge of French cuisine. Members of AF de DuPage adore Chris’ croissants and crepes, and he often holds crepes parties to celebrate the fluffy pastry. “There’s just something about that gratification of giving people a good meal, and there’s something about getting families together while eating,” he says. AF de DuPage is like a big family, says Charles Coulon, of Wheaton. He was born in France, has lived in Illinois since 2006 and is now an American citizen. Coulon is a former group president and webmaster; he’s currently the co-vice president. Like Coulon, most members hail from western DuPage County and eastern Kane County, so it’s only natural that most activities happen around this area, too. However, people have come from as far afield as Tinley Park and Rockford. Because there is no one set meeting place, this is truly a moveable “feast for friends,” says Coulon. The benefit of not having a dedicated space is that activities can take many forms. Meetings may include conversation groups, book reviews or Christmas parties. And during the holiday season, members find there’s nothing quite like carol singing around a fireplace. Together, they’ll sing “Silent Night” in French, to the tune of “Jingle Bells.” It’s a tune everyone seems to remember, so that makes it easier to sing regardless of what language you speak, says Coulon. 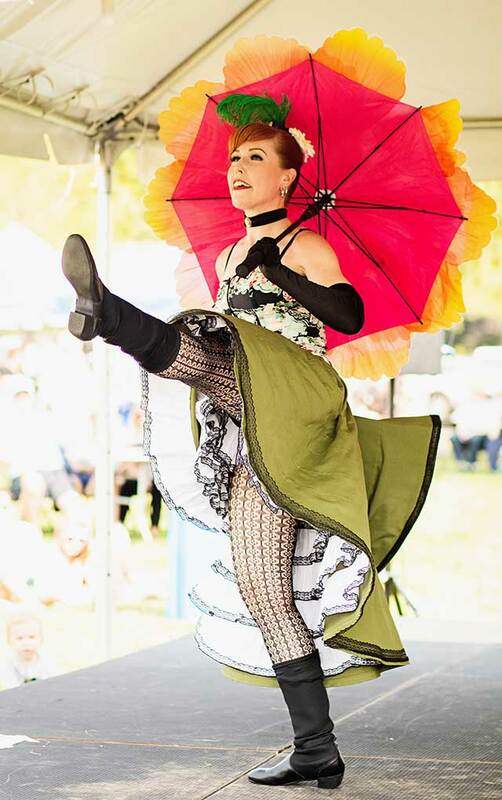 The annual French Connection Day, at Cantigny in Wheaton, includes many French cultural activities, including Cancan dancers and musical performers. “First, when I came here, I wanted to find a group that I could share my French background with,” Coulon says. “I found Alliance Française de DuPage a couple of weeks after moving here. When I saw there was a conversation group in Wheaton, I became interested. I’ve been with them ever since. It’s a good group. An important event for lovers of French culture is French Connection Day, held at Cantigny Park in Wheaton. Cantigny was established by Col. Robert R. McCormick, former publisher of the Chicago Tribune and a veteran of World War I. After returning home from serving with the U.S. Army’s First Infantry Division, McCormick named his estate after the location of his division’s most famous battle. For one Sunday each August, dozens of organizations and businesses gather to celebrate all things French. Around the grounds, vendors sell everything from breads, pastries and jams to wine and artwork. AF de DuPage sells dozens of donated French-inspired items, including artwork, French books, stamps and statuary to raise money for the organization, which otherwise depends on membership dues. Beyond the booths on an open-air stage, singers belt classic French music, including “La Vie en Rose,” a tune made popular by the French singer Edith Piaf in the 1940s. On another stage, Cancan dancers perform the famous cabaret dance to enthrall the crowds, which number up to 2,000. Not all of AF de DuPage’s activities are French, per se – but there’s always an angle. The Tahitian Luau, held recently at a member’s Lombard home, isn’t exactly French, but it’s fun to imagine that French explorers – and perhaps the famed French artist Paul Gaugin – might have indulged in some luaus during their adventures in French Polynesia. AF de DuPage has come a long way from its start in that basement of a Realtor’s office. The group now has some 500 people on its mailing list. Cowart usually visits Paris once a year to keep up with French culture. AF de DuPage is proof positive that the American melting pot has many flavors. This entry was posted on Monday, September 24th, 2018 at 11:59 am	and is filed under Features, Top Posts. You can follow any responses to this entry through the RSS 2.0 feed. Both comments and pings are currently closed.